The results of a new study offer very good news for expectant parents: a remarkably accurate prenatal genetic test for Down syndrome that requires only a blood sample from the mother. Expectant parents have a lot to deal with. What can a mom-to-be eat, drink, or do to ensure the health of the baby? There is plenty of advice out there, both good and bad, but one area that has advanced rapidly in recent years is prenatal genetic testing. We now have tests that can identify a small but growing number of genetic disorders early in pregnancy. 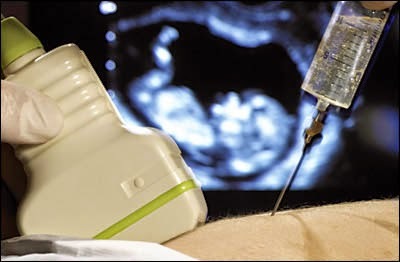 Until recently, the only way to test the genetic makeup of a fetus was through amniocentesis ("amnio"), an invasive procedure in which a doctor inserts a long needly directly into the womb and collects a sample of amniotic fluid. This test is not only uncomfortable, but it also carries a small risk of miscarriage. Fortunately, it may soon become completely unnecessary, thanks in part to advances in DNA sequencing. The new study by Mary Norton and colleagues, by far the largest of its kind to date, involved almost 19,000 women at 35 locations in 6 different countries, all of whom were undergoing routine prenatal screening. The study compared the standard blood test, the "triple screen", to a new cell-free DNA sequencing (cfDNA) test from Ariosa Diagnostics (recently acquired by Roche). I wrote about a similar study involving 1914 patients last year, which used the same kind of DNA testing. The new study is ten times larger, and the results are even better. All of the participants had both standard screening and DNA testing. What did they find? First, the number of mothers who had both standard and cfDNA testing was 15,841. (For technical reasons, some of the 19,000 participants didn't get both tests.) Out of all pregnancies, there were a total of 38 fetuses with trisomy 21. Standard screening detected 30 out of 38, while cfDNA detected all 38. Much more impressive–startling, really–was the difference in false positives. The standard screen had 854 false positives, while cfDNA testing only had 9. This is nearly 100 times better. Or to put it another way: among all the mothers, standard screening reported 884 "positive" results, of which only 30 were correct. Thus if you were a mom who got the standard screen, and you had a positive result, there was only a 3.4% chance that your baby would have Down syndrome. Nearly all of these mothers would probably elect amniocentesis to confirm, and go through the anxiety as well as risk of miscarriage that amnio entails. The cfDNA test reported only 47 positive results, of which 38 were correct. Thus there was an 81% chance (38/47) that the baby will a positive result would have Down syndrome. Although the numbers were smaller, cfDNA testing was also far more accurate for detecting trisomy 13 and 18, rarer conditions that cause health problems so severe that most infants die before reaching their first birthday. With a false positive rate nearly 100 times lower than the standard blood test (9 versus 854 false positives), the superiority of DNA testing for prenatal screening is clear. Let's hope that we can soon replace the older blood tests and spare parents-to-be the anxiety and unnecessary follow-up testing caused by thousands of false positive results under the current standard of care. *For those who want to understand the technical details, this paper by Sparks et al. (2012) explains the sequencing and statistical methods. This is an incredibly important find and can help so many new parents prepare. Hopefully these findings can lead to us understanding more about Down syndrome.